1. Spray Pam in a small baking dish. Line a baking sheet with aluminum foil. Preheat oven to 400 degrees. 2. Wash squash. Cut away the stem and top of the squash. Cut the squash in half lengthwise. Remove seeds completely. Place squash on the baking sheet. Brush ¼ of a cup of the melted Earth Balance on both halves. Sprinkle the cloves and cinnamon on the squash along with ½ of the sugar. Put the pecans in the open area of each squash. Pour the rest of the sugar over the pecans. 3. Put squash in the oven and bake until soft, about 1 hour. 4. When the squash is done, set it on a plate to cool. Remove the pecans and reserve them as a garnish. Spoon the squash into the baking dish. Whip it up a bit with a fork. Decorate the top with the roasted pecan halves. Pour the remaining Earth Balance on top of the squash and refrigerate until ready to heat and serve. 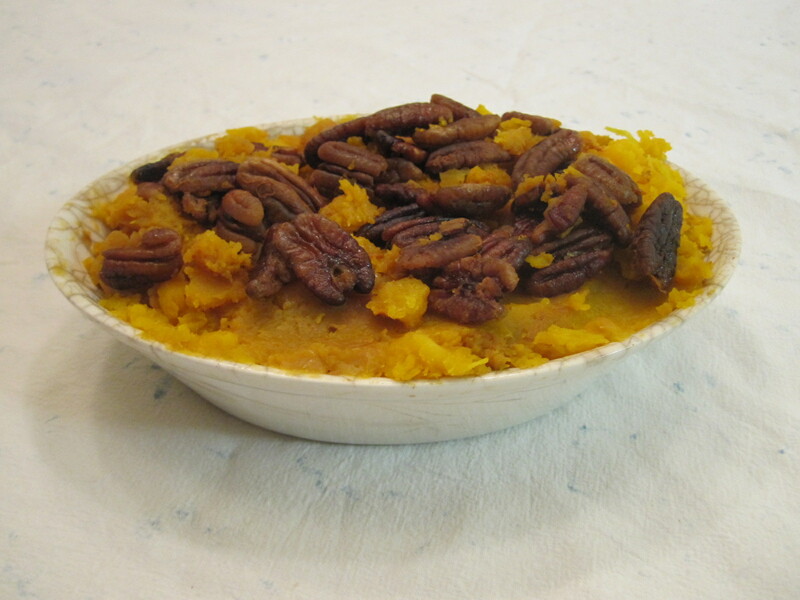 Let us know what you think of this easy vegan recipe: Whipped Butternut Squash with Cloves and Pecans!